His Majesty Usain Bolt came back on the track and he made his debut in this 2016, the year in which the velocity star will run the last Olympic Games of his life. We still do not know if this will be his last season, due to his statements and second thoughts regarding his partecipation at the 2017 London World Championships. The Jamaican ran 100m during the Cayman Invitational winning the race in 10”05: a time which is not spectacular, but we have to consider that we are only at the beginning of the season. Bolt’s race seemed to be rusty until the 50-60 meters: the multi-Olympic champion in fact, was not able to make the difference until half the race, when he finally managed to distance everyone. ”I did not feel very fluid, but I was expecting that because it is the first race of the year. Just like last season, I need more races to get more competitive. I am not worried at all” Bolt stated just after the race. To complete the podium there were respectively Dentarius Locke (10″12) and the 24 y.o. Jamaican Kemar Bailey-Cole who finished his race in 10″18. The next 20th of May we will see Bolt again in Ostrava for the eight time: in the Czech city, the Jamaican is unbeaten with seven victories out of seven. Against him there will also be the Decathlon phenomenon Ashton Eaton, who as a PB of 10”21 on the 100m. 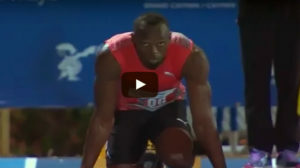 Furthermore, Bolt holds two records in the meeeting: 19″83 in 200m and 30″97 in 300m. In 2009 he ran the 100m in 9”77, a time which does not display as the meeting record due to too much wind. We can just but wait for a great show!